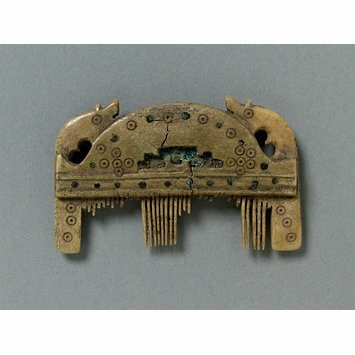 This is an Anglo-Saxon comb probably made in the 8th - 9th century. This comb is in bone with a single row of teeth, the top arched and terminating in recurved dragon heads. On each side are pierced bone plates incised with circles and fastened together with copper pins. The comb was found during the excavations for the Metropolitan Railway Extension to Aldgate in 1876, London. Combs of this general type were ubiquitous troughout Europe, from Southern France to Scandinavia, from the Late Roman period to the 19th century. The design and decorative motifs varied remarkably little over a millennium, with only minor changes being introduced and stylistic innovations remaining infrequent. A composite comb made of bone with fine teeth, the top arched and terminating in curved dragon heads. Fastened together by copper pins. It is made of three sections: the teeth and zoomorphic terminals are carved from one section of bone and the two side plates are riveted to it. The sides and top are decorated with ring-and-dot ornament, alternating with the rivets on the curving back of the comb. On each side are three t-shaped recesses, two inverted, which must once have been filled with another material, perhaps bronze or coloured paste. Found during the excavations for the Metropolitan Railway Extension to Aldgate in 1876, London. Purchased from G. Wallis, London. 'who bought it from a navvy' (Museum records) in 1877 (10s). Combs of this general type were ubiquitous troughout Europe, from Southern France to Scandinavia, from the Late Roman period to the 19th century. The design and decorative motifs varied remarkably little over a millennium, with only minor changes being introduced and stylistic innovations remaining infrequent. The later examples, especially those in Norway, are conspicuously retardataire, following models made further south many hundred years earlier. 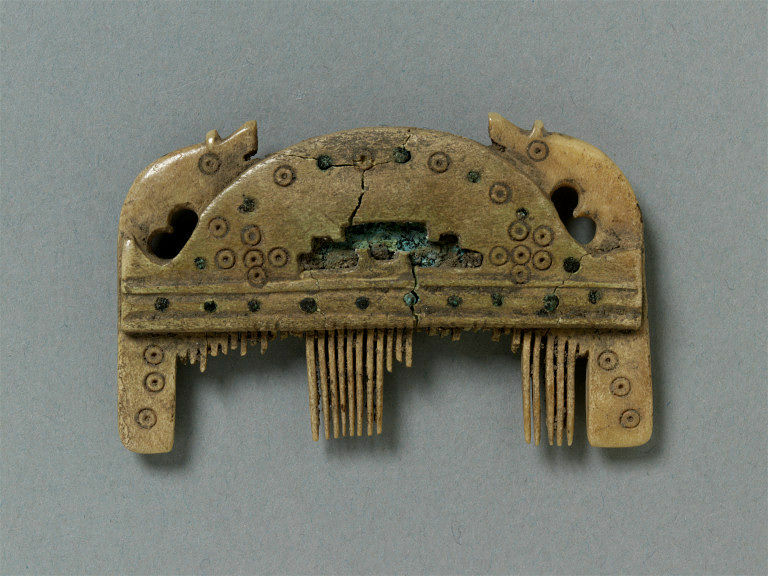 The distinctive feature of the T-shaped recesses on the side panels seen here perhaps sets the present comb apart from the earliest examples and was copied in some alter Norwegian combs, so a date in the decades before the Viking incursions in England, or shortly afterwards, seems plausible.